Editor’s Note: This is the first in a series of stories spotlighting the work being done by area chambers of commerce and other economic-development-related agencies. We start with Northampton Area Young Professionals. 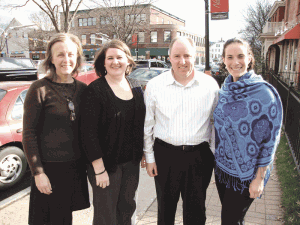 From left, Suzanne Beck, Lynn Kennedy, Rich Horton, and Kate Glynn. That’s the name the Northampton Area Young Professionals — or NAYP, as the group calls itself colloquially — are using for the new leadership that has been steadily helping to reinvent the organization. Some departures in the prior leadership of NAYP have led the group to take a look at its core values and mission. Kate Glynn is the owner of A Child’s Garden and co-owner of Impish, two children’s stores in downtown Northampton, and she said they were necessary changes for the group to evolve. “Over the past four years of NAYP being up and running, we’ve learned that young professionals change careers,” she said. “We’re at a time in our lives where people get new opportunities, professionally speaking, or they’re making big changes in their private lives, having babies. And that’s the nature of being a young professional in today’s world. “So, rather than have a static organization that isn’t flexible, nor addressing actual needs, we’ve decided to open it up and re-examine,” she added. “Historically it’s been what we called the leadership team — 10 or 12 people, a president, vice president, with committees underneath that,” he said. “So we decided to pull back and make the leadership roles a committee, with an executive team at its core. That team will have five members responsible for strategy, making sure everything gets done, with project leaders overseeing specific issues. The sixth de facto member of the executive team is Lynn Kennedy, the NAYP’s liaison within the Northampton Chamber of Commerce. She was quick to add that, while all this talk of restructured leadership and changing titles might sound like an entirely new organization, NAYP will not change in the way the group functions for its members. “But there is one change that we want them to see,” she added, “and that is how to get involved, and at what levels. They don’t need to make these excessive commitments to get involved — they can be involved at the level that works for them. While the NAYP team was talking out the changes that are still taking place, they did state that they are, as always, ready to get down to business. Talking with BusinessWest for this inaugural feature, NAYP members said that, at its next meet-and greet-function to take place on Jan. 12, relative terms like ‘young’ and ‘area’ keep it pretty open as far is who is welcome to attend. She was one of the early members of NAYP, which is not yet five years old. Initially, there was a common theme among other businesspeople like her, that a lack of a forum for young professionals needed to be addressed. The Northampton Chamber of Commerce also realized early on the importance of such an organization, and NAYP considers them a sponsor and its biggest advocate. Suzanne Beck is the chamber’s executive director, and she told BusinessWest that there has always been a lot of talk in the Valley about who is that next generation in business and what is their commitment to the region. The chamber’s commitment to NAYP has stemmed from that question. Borrowing an idea from the playbook of the Young Professional Society of Greater Springfield, NAYP launched what it calls a Nonprofit Board Fair this past summer. “What we find is that a lot of young professionals have interest in nonprofit leadership opportunities, but don’t have any clue as to how to get on a board,” said Horton. “We worked closely with the local United Way,” he continued, “and we reached out to other nonprofits and stipulated that they had to have a board opportunity opening in the next six months. They didn’t have to actually take any of our folks, but they did have to have an opening.” The meeting was well-attended, and all members said that this was assuredly the first of an unfolding tradition for NAYP. From the perspective of the chamber, Beck said NAYP fills a need for that developing generation of businesspeople in the region. As one of those former students, Glynn said that it is exciting to see the possibilities for new members within NAYP’s frameworks, because a larger membership means more opportunities for individuals and for the organization as a whole. With a committee-based leadership, Kennedy noted that this structure will be an asset in how those opportunities are addressed. “In the past, we had so many things that we wanted to do, but only a small number of people able to get things done,” she said, adding that the organization will look hard at prioritizing programs and then maximizing its available young talent to carry them out. But as the assembled members of NAYP said, the core mission of the group will always be welcoming anyone who wants to be a member. There are currently 135 dues-paying NAYPs, and the goal is for that number to rise.